HPLC system care and troubleshooting is an important activity in any analytical chemistry lab. Liquid chromatography systems have become real workhorses for laboratory chemical analysis, but scientists have developed a love-hate relationship with these systems. The wide range of applications delights users, while varied complexity, robustness, and performance frustrate them. Unlike other laboratory tools, these systems are not a “plug and play” solution. There are several brands and models, but the basic operation is similar across the board. Lab technicians need some training and experience to get LC systems to perform well. 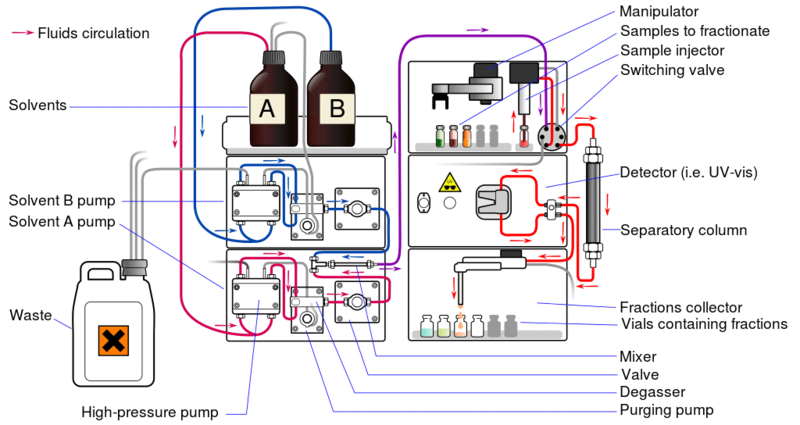 This article will cover the basics of maintaining and troubleshooting your HPLC system. Most pump-related issues are due to a failure to prime the system properly. Upon startup, users should always prime the pump and verify that the flow is constant on all channels. Pump-priming issues can be detrimental to chromatography results in several ways, including no flow, erratic flow, mixing problems, incorrect gradients, bubble formation, and more. Isocratic Pump – This is the simplest pump type. It uses a single pump to deliver a single solvent for the mobile phase. Binary Pump – This pump uses two pumps and can mix up to two different solvents in varying proportions over the course of a run for gradient mobile phases. Quaternary Pump – This pump uses a single pump, but has a special proportioning valve to mix up to four different solvents for complex mobile phase gradients. Injector Failure – Sample is not introduced to the flow path. Check injector. Clean if it’s clogged. Repair if malfunctioning. If you’re using an autosampler, check to see if it’s aspirating sample successfully – bypass the autosampler and manually inject sample to see if it’s the problem. Pump Failure – Mobile phase not flowing. Check/repair pump. Detector Failure – Check/adjust detector settings (gain, sensitivity). Check/replace the lamp. Column Issues – Sample is binding to the column and not eluting – change separation column and/or guard column type. Solvent Issues – Sample is incompatible with mobile phase, or mobile phase is not compatible with column – change mobile phase solvent. Solvent Issues (evaporation/concentration changing, atmospheric gas absorption/pH changing, leaks) – De-gas and sparge solvent with an inert gas. Seal solvent containers. Check for and repair leaks (tubing, fittings). Gradient Issues (one solvent absorbs/retains more of the sample than other) – Change one or both mobile phase solvents. Employ baseline subtraction. Contaminated Column – Flush column with solvent. Change column type to avoid build up and slow release. Pressure Issues – Filter mobile phase and samples. Reduce sample or solvent viscosity. Use larger tubing. Temperature Issues – Look for changing temperature over the run. Control temperature in the detector flow cell. Temperature Issues – Stabilize environmental control. Check for effects from the HVAC system or other nearby equipment that throws off heat or cooling. Control temperature in the detector flow cell. Bubbles / Mixing Issues (in the pump) – Flush and prime pump. De-gas mobile phase. Increase system volume. Clogs (partial) – Remove clog. Replace tubing. Flush with solvent. Pump Issues – Repair or replace the pump. Electrical Noise – Look for and remove sources of interference with a cyclical pattern. Change circuit. Install line conditioner. Bubbles (in the mobile phase, column, or detector) – Check for and repair leaks (tubing, fittings). De-gas mobile phase. Flush or backpressure detector cell or column to removed trapped bubbles. Contaminated Column – Flush column with solvent. Change the column. Electrical Noise – Check connections. Look for and remove sources of interference. Clean contacts. Shield cables. Change circuit. Install line conditioner. Detector Issues – Flush detector cell using manufacturer’s cleaning protocol. Adjust sensitivity/gain. Replace the lamp. Bubbles – Check for and repair leaks (tubing, fittings). De-gas mobile phase. Electrical Wiring Issues – Check wiring, leads, and connectors. Repair or replace broken wiring or connectors. Clean connectors and leads. Electrical Noise – Check connections. Look for and remove sources of interference with a sharp, intermittent pattern (valves, compressors, lighting). Clean contacts. Shield cables. Change the power circuit. Install line conditioner. Detector Issues – Check and replace the lamp. Pump Issues – Repair or replace the check valve. Repair or replace the pump plunger or seals. Check for and repair leaks. Bubbles / Mixing Issues – Check for and repair leaks (tubing, fittings). De-gas mobile phase. Flush or backpressure detector cell or column to removed trapped bubbles. Increase system volume. Electrical Noise – Check connections. Look for and remove sources of interference with an intermittent pattern. Clean contacts. Shield cables. Change circuit. Install line conditioner. No Issues – Negative peaks may be normal if you’re using a refractive index detector – no changes. Solvent Issues – Filter solvent. Change to different solvent. Bubbles – De-gas mobile phase. Only Negative Peaks – Change detector polarity. 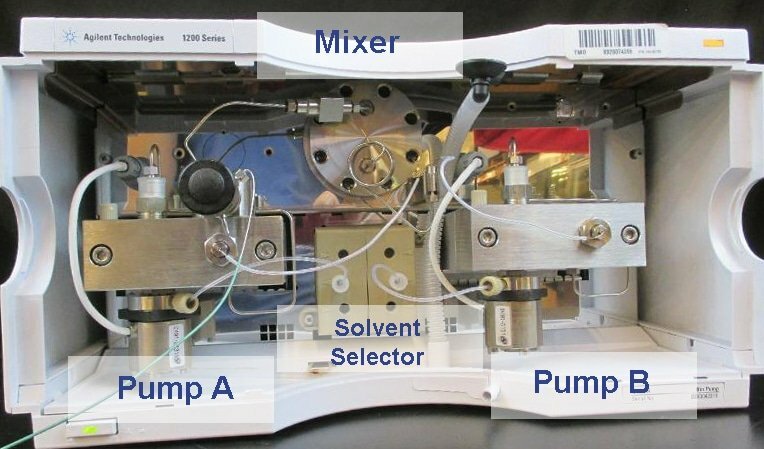 Injectors transfer your sample from the source vial or plate into the LC system flow path. Once introduced, the sample flows through the column to the detector(s) and out to the waste. Once again, improper priming can be the main cause of issues relating to the injector. Any air present in the system can affect the injection volume and cleanliness. Priming the system properly removes air bubbles from the sample and wash syringes. This will improve the system reproducibility and reduce sample carryover. Maintaining your separation column is critical for your LC system. This is the heart of the system. This component enables the separation of constituents in your sample. Problems with your column will translate directly to your results. Refer to your column’s documentation for appropriate wash and storage solvents to use. Always flush the column after runs with a compatible organic solvent. Failure to clean your column will impact column life and performance. This is especially important if you plan to store the column for an extended period. Replace your column if the packing material has become contaminated or ineffective. Run a test standard through the system regularly to track changing column performance. There are many detector types and models available for LC systems. But, detector maintenance is a simple procedure that’s common across types. You need to know the back pressure your detector flow cell generates at a known flow rate for a solvent. This will create a baseline for you when troubleshooting the system. You can use this value to gauge system readiness. Record the pressure while flushing solvent through the detector (D). Remove the inlet line to the detector and record the pressure again while flushing (C). This is important because the most common issue with detectors is a clogged flow cell. If the flow cell is partially plugged, the pressure will be much greater at the detector inlet. The flow cell can rupture if completely plugged, resulting in an expensive repair. To maintain the flow cell, always flush with a clean solvent that is at least 20% organic. This will help maintain the flow cell and keep it clean and free of blockages. Improper connection of tubing in fittings can also have an impact on results. A common error is to leave a void at the end of the tubing inside of the fitting. It’s important to seat the tubing flush to the end of the fitting. LC tubing size can have a tremendous impact on chromatographic results. When replacing tubing, make sure to use the correct sizes. If the tubing internal diameter (ID) is too big it will cause peak shape issues. Peaks will become wider (and shorter with larger tubing). If the tubing is too long or too narrow, it will generate higher pressures and can also cause peak issues. The mobile phase is the solvent that carries your sample through the HPLC system. This can be water, an aqueous buffer solution, or an organic solvent or mixture. You can use an isocratic mobile phase – a single solvent at a constant concentration. Or you can use a gradient mobile phase – two or more solvents at changing ratios over time. The majority of HPLC issues originate from mobile phase problems. Start with fresh HPLC grade solvents. If using water, get it from an HPLC-grade purification system. Filter the mobile phase using a 0.2-micron filter. De-gas the solvents well before use. Never add more solvent to open bottles; replace them when empty. Bacteria can grow in pure water; be careful to use fresh, filtered water. Use a 10-20% organic solvent/water mixture to inhibit bacteria growth for storage. 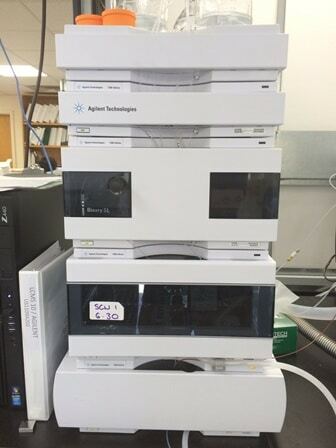 Of all of the types of lab equipment, HPLC systems tend to be the most DIY-friendly for maintenance – and their owners tend to be pretty skilled as well. It comes with the territory. Not every problem is easy to solve and regular preventative maintenance service is important for continued performance. Atlantic Lab Equipment would be happy to work with you to help with your yearly PM services. Also, if you have equipment that’s no longer used, we’ll buy your surplus lab equipment. Of course, if you’re looking to expand, or get a backup 0f your favorite system, we provide high-quality refurbished equipment.